Lord of the path, guide us on our way; go close before us. Drive away that which would do us harm. Protect us from deceit, wherever it be. We desire the help that you gave our people in times past. Lord of prosperity, make wealth easy to acquire. Make our paths easy to travel, lead us to happy destinations. May you provide for us and invigorate us. May it find favour with you. Who is eloquent and cunning. Who is dear to all the Gods. And is eloquent, wise and cunning. Guide us on our way; restrain arguments. It is well known that in the ancient world Gods of different pantheons were often equated with each other (in the Religio Romana we call this the interpretatio Romana - Caesar, Cicero and Tacitus are perhaps the most famous Romans to have adopted this approach), with the assumption being that the same (major) Gods manifest differently across cultures. 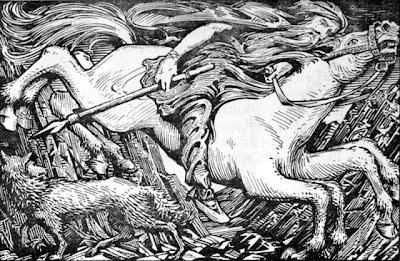 Thus the Germanic God Woden (later to be known as Odin) was equated with Mercury, as was the Hellenic God Hermes and the Egyptian God Thoth. Using the same approach it could be surmised that the Vedic God Pushan may (possibly) be Mercury by another name - however Pushan is no longer a major God of the Indian pantheon, but Shiva, also known as Pashupati, the Lord of cattle/animals, is (Shiva as we know him today was unknown in Vedic times). The Rig Veda has "Pashupa" (protector of cattle) as a name of Pushan - thus if we are looking for the contemporary Hindu equivalent of Mercury perhaps we need look no further than Lord Shiva himself. 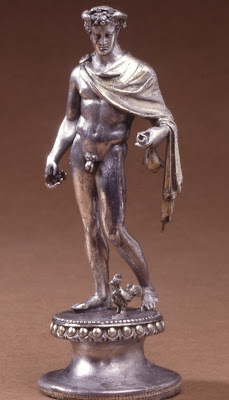 Roman era statuette of Mercury in silver (orig. France). Mercury by Augustin Pajou (c.1780 CE). 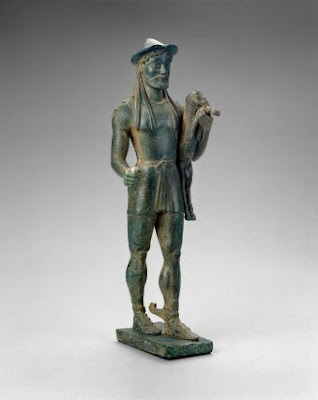 Bronze statue of Hermes the ram-bearer, c 500 BCE (Greece). 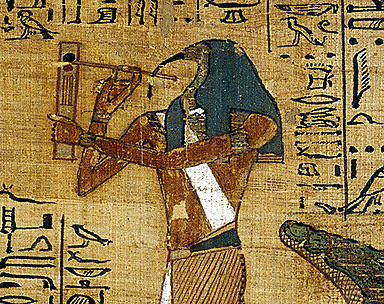 Detail of papyrus manuscript depicting Thoth, c. 1275 BCE (Egypt). * Likewise, both Pushan and Mercury are associated with goats. My pleasure:) Unfortunately I cannot recommend any good books on this topic because, strangely, very few scholarly books offer comprehensive treatment as to deity attributes – instead such information tends to be scattered through the pages of a variety of good books such as Beard et al’s “Religions of Rome 2: A Sourcebook” or in the notes to the Penguin Classics edition of Ovid’s Fasti. For something faster and cheaper you might consider looking to the right side of this blog and clicking on the “Labels / Index of this Blog” (eg, you may find my October 2013 post on “contemporary visions of the divine” a useful quick reference guide) or you might want to Google “Theoi mythology” – this will take you to an excellent website dealing with the Gods from a Hellenic perspective, so it is not Roman but the Hellenic and Roman pantheons have a great deal in common so it is a good starting point. 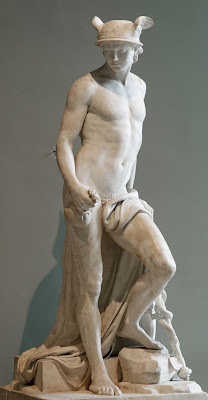 The Deo Mercurio website is quite good for a Gallo-Roman perspective on the Gods. Thank you,i've been looking for this for a looong time but didn't know where to look.